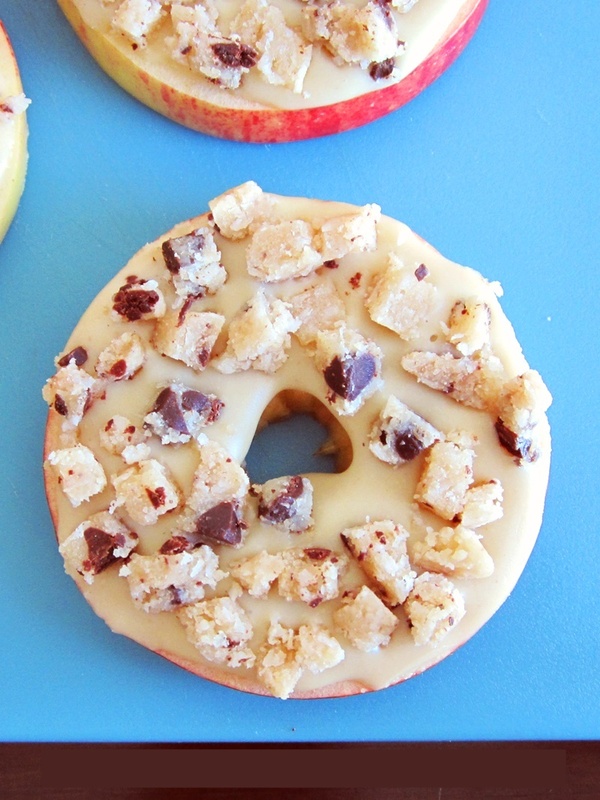 The pictured version is made "donut-style" with Hail Merry Raw Chocolate Chip Cookie Dough Macaroon bits, but you can keep it simple or add your toppings of choice. Place the cashews in a spice grinder or food processor*, and process until finely ground and beginning to clump. Add the coconut oil, vanilla, and salt, and process again until smooth and creamy. Spread the cashew butter onto one side of each apple round. If toppings are desired, add them now and press lightly into the cashew butter. Chill in the refrigerator for 30 minutes. The coconut oil will help the cashew butter set up like a rich, creamy glaze. *If using a medium to large food processor, you may want to double the batch of cashew butter. This would be 1 cup cashews, 2 tablespoons melted coconut oil, ½ teaspoon vanilla, and a big dash of salt. **If you are concerned about browning, you can toss the apple rounds with citrus juice (lemon, pineapple, or orange).